Looks like Zombie ate Italian tonight! Now that’s what I call a debut. What do you think, has the team got what it takes to fulfill the “hero” archetype? Another stellar page from Rove and Ed; this page was a blast to letter as well as write. It’s always fun to sit back and beg your inner ten year-old – I keep mine in a small freezer next to the couch – for sound effects. Well that was over quite fast, and most of those guys didn’t know what hit them. But saying it was easy could be asking the other 20 guys to come in guns blazing. It’s also interesting to see the heroes are just as violent as the bad guys. Shades of gray and all that. I agree with Mel T, it is interesting how they didn’t follow the traditional superhero code of never killing… and ohmyword I love the GORE!!! >:D Just lookit that eye in panel 3 going “ptuiii!”, outta there! Wow. I did NOT expect a massacre. I was more expecting traditional superhero rounding-up of villains, not a zombie ripping the flesh from one of their necks. Crazy awesome. I will echo the sentiment of everyone else, I didn’t see that coming. Great work guys! Yes that WAS really easy… It feels like a row of executions rather than a fight. There may be some kind of storytelling point about portraying this as such a total piece of cake though, so I remain neutral. Savy is such a badass. Fantastic page today! Thanks so much for your comments, everyone! Really glad that you dig the page; I’m especially happy to see some surprise at the team’s actions. When I was writing the series I became so attached to the characters and knew them so well (hell, I created them) that I sometimes forget you’re seeing them for the first time, seeing their actions unfold. So for me that’s cool to see. Well, I’m out. For the longest time this comic was on the borderline for me: the story often being rushed and clichéd, a bit hard to follow in points, and never outstandingly interesting. Still, I held out hope. But with today’s comic any likability of any of the characters has been thrown out the window. I mean, which group of remorseless psychopaths am I supposed to be rooting for here? 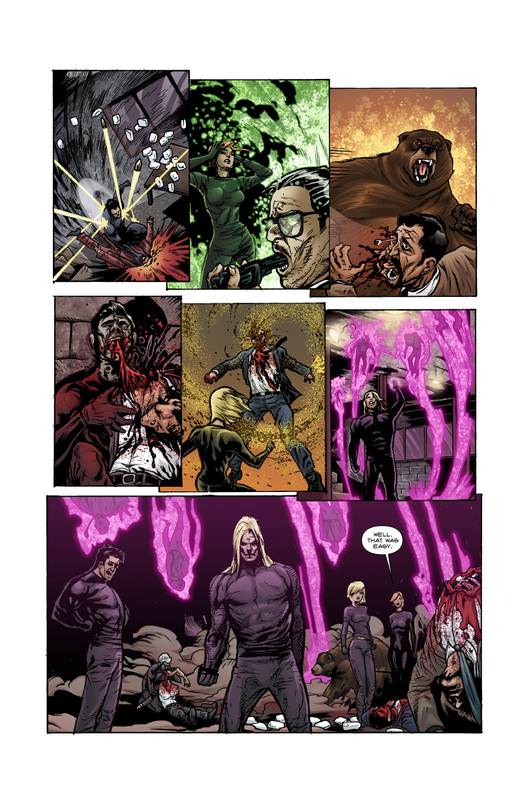 In my book, a wealth of action and gore just doesn’t make up for a lack of storytelling or solid characters. But, hey, maybe that’s just me. Best of luck with it. Don’t listen to HumalaDuck, he’s a nerd. I actually enjoy that they’re rather ultra-violent. Most ‘heroes’ abide by the no-killing clause, which I find frustrating in many cases. I mean, in cases where the perpetrator has repeatedly slaughtered innocents and then the ‘hero’ let’s them get away because they couldn’t kill them I don’t think the protagonist was much of a hero at all! Sometimes death is necessary. How could they have stopped a room full of heavily armed drug-running arms dealers without deadly force and without any of our protagonists dying? Awesome page guys! Now I am waiting for the uber tough bad guy to enter the scene and give them a challenge. HumalaDuck, it’s definitely just you. I’d like to offer a little perspective here. These kids were given amazing powers that are more responsibility than any one should be able to handle, and thrown into a situation where there’s no time to react and their lives are being threatened. Its easy to judge where the story went, but I’d probably try to end that battle before it started by whatever means necessary. Do you use your powers for righteousness? Or for your own ends? Does power corrupt? Lines between hero and villain blurred a bit? Ps. Wynn ended the situation without murdering anyone. Wink. Wink. Ryan is an amazing writer and rest assured he’s driving this ship with skill and finesse, and though you may not understand things now, all will be revealed. If you don’t want to sit back and enjoy the ride, cool, but get the balls out of the car. The moment these people were given abilities and thrust into this situation, their concepts of morality and reason were put into question. Terminals is not a raindrops and puppy-dogs homage to super-heroes. There’s no such thing as a truly righteous hero, be it in fiction or real life. The “hero” as seen in our history, and in this comic, can’t be interpreted in simple black and white. Besides, you all haven’t seen the big twist yet. As for a lack of storytelling and too much gore/action… I do believe we went almost the entire first two issues (that’s 44 pages) without showing anything you can’t see in a kid’s cartoon. Ask the letterer, so far there has been more character-character dialogue than The King’s Speech.